​B Green, formerly known as The Institute for Green Business Certification (IGBC - ©2006-2018), which began in the USA in 2006, is a third-party, non-governmental certifying body, helping businesses of all sizes lessen their environmental footprint. Today’s successful businesses are progressively working towards taking on a greater role of environmental responsibility and creating a sustainable social impact with the adoption of a “green” business model. Many are inspired to do so by increasingly popular customer interest in environmentally-friendly practices and products, and particularly the resulting support and loyalty that they show companies and businesses that are “green”. Businesses are also reaping in added benefits, which include reduced operational costs and the intrinsic value added within an organization by adopting a vast array of green business practices. ​Contact us today to find out more about how your company can become Green Business Certified. "Twelve years ago I purchased a neighborhood dry-cleaner in NDG, knowing full well that the use of the traditional solvent used in dry-cleaning, known as PERC, was not only bad for the environment but for my employees' health as well. That is when I decided to go green ten years ago and we became the first 100% ecological dry-cleaner in the entire Province of Quebec. Despite recycling hangers and using biodegradable packaging, I knew that more could be done. That is when the B Green (formerly The Institute of Green Business Certification) stepped in. Philippa Settels, guided us through the many recommendations and easy, possible ways to attain a lighter environmental footprint. 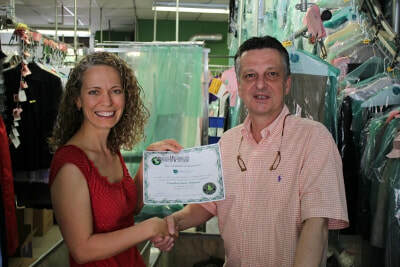 Thanks to B Green, my business is now greener then ever and has been recognized as Green Business Certified." "Interested in becoming Green Certified? Well I have done it and having my business certified is one of the most long term commitments we have ever taken. Not only is it beneficial for the business, but it solidified our business vision and gave the employees a great sense of belonging. The impact of this process is without a doubt very good and so satisfying, environmentally speaking. The impact is so much more than just for the business, it influences us in our lives, in general. At home with the family, we have also become more aware of our footprint and we have now more tools to help us become ''greener''. Running a business today is challenging in all aspects from sales to finances to human resources, thus when we have a chance to do something Greater, it is a wonderful feeling. The businesses of tomorrow will have to be more socially and environmentally inclined for success in the long run as well."